If you haven’t noticed, CRTs are getting hard to find. You can’t get them in Goodwill, because thrift stores don’t take giant tube TVs anymore. You can’t find them on the curb set out for the trash man, because they won’t pick them up. It’s hard to find them on eBay, because no one wants to ship them. That’s a shame, because the best way to enjoy old retrocomputers and game systems is with a CRT with RGB input. If you don’t already have one, the best you can hope for is an old CRT with a composite input. But there’s a way. [The 8-Bit Guy] just opened up late 90s CRT TV and modded it to accept RGB input. That’s a monitor for your Apple, your Commodore, and a much better display for your Sega Genesis. There are a few things to know before cracking open an old CRT and messing with the circuits. Every (color) CRT has three electron guns, one each for red, green, and blue. These require high voltage, and in CRTs with RGB inputs you’re looking at a circuit path that takes those inputs, amplifies them, and sends them to the gun. If the TV only has a composite input, there’s a bit of circuitry that takes that composite signal apart and sends it to the guns. In [8-bit guy]’s TV — and just about every CRT TV you would find from the mid to late 90s — there’s a ‘Jungle IC’ that handles this conversion, and most of the time there’s RGB inputs meant for the on-screen display. By simply tapping into those inputs, you can add RGB inputs with fancy-schmancy RCA jacks on the back. While the actual process of adding RGB inputs to a late 90’s CRT will be slightly different for each individual make and model, the process is pretty much the same. It’s really just a little bit of soldering and then sitting back and playing with old computers that are finally displaying the right colors on a proper screen. Recently I spent an enjoyable weekend in Canterbury, staying in my friend’s flat with a superb view across the rooftops to the city’s mediaeval cathedral. Bleary-eyed and in search of a coffee on the Sunday morning, my attention was immediately drawn to one of her abode’s original built-in features. There on the wall in the corner of the room was a mysterious switch. Housed on a standard-sized British electrical fascia was a 12-position rotary switch, marked with letters A through L. An unexpected thing to see in the 21st century and one probably unfamiliar to most people under about 40, I’d found something I’d not seen since my university days in the early 1990s: a Rediffusion selector switch. If you have cable TV, there is probably a co-axial cable coming into your home. It is likely to carry a VHF signal, either a series of traditional analogue channels or a set of digital multiplexes. “Cable ready” analogue TVs had wideband VHF tuners to allow the channels to be viewed, and on encrypted systems there would have been a set-top box with its own analogue tuner and decoder circuitry. Your digital cable TV set-top box will do a similar thing, giving you the channels you have subscribed to as it decodes the multiplex. At the dawn of television transmission though, none of this would have been possible. Co-axial cable was expensive and not particularly high quality, and transistorised wideband VHF tuners were still a very long way away. Engineers designing the earliest cable TV systems were left with the technology of the day derived from that of the telephone networks, and in Britain at least that manifested itself in the Rediffusion system whose relics I’d found. In the UK, the public service BBC broadcaster produced a brace of series’ over the decade probing all corners of the subject as part of the same Computer Literacy Project that gave us Acorn’s BBC Micro, and we are lucky enough that they’ve put them all online so that we can watch them (again, in some cases, if a Hackaday scribe can get away with revealing her age). You can see famous shows such as the moment when the presenters experienced a live on-air hack while demonstrating an early online service, but most of it is a fascinating contemporary look at the computers we now enthuse over as retro devices. Will the MSX sweep all before it, for example? (It didn’t). They seem very dated now with their 8-bit micros (if not just for the word “micro”), synth music, and cheesy graphics. But what does come across is the air of optimism, this was the future, and it was packaged not as a threat, but as a good place to be. Take a look, but make sure you have plenty of time. You may spend a while in front of the screen. We’ve mentioned int he past another spin-off from the Computer Literacy Project, the Domesday Project. Thanks [Darren Grant] for the tip. When it has become so common for movies and television to hyper-sensationalize engineering, and to just plain get things wrong, here’s a breath of fresh air. There’s a Sci-Fi show out right now that wove 3D printing into the story line in a way that is correct, unforced, and a fitting complement to that fictional world. 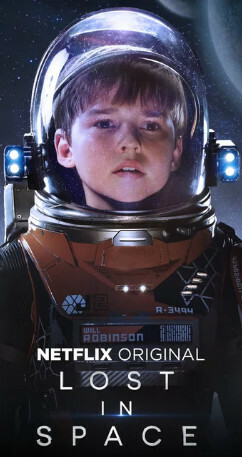 With the amount of original content Netflix is pumping out anymore, you may have missed the fact that they’ve recently released a reboot of the classic Lost in Space series from the 1960’s. Sorry LeBlanc fans, this new take on the space traveling Robinson family pretends the 1998 movie never happened, as have most people. It follows the family from their days on Earth until they get properly lost in space as the title would indicate, and is probably most notable for the exceptional art direction and special effects work that’s closer to Interstellar than the campy effects of yesteryear. But fear not, Dear Reader. This is not a review of the show. To that end, I’ll come right out and say that Lost in Space is overall a rather mediocre show. It’s certainly gorgeous, but the story lines and dialog are like something out of a fan film. It’s overly drawn out, and in the end doesn’t progress the overarching story nearly as much as you’d expect. The robot is pretty sick, though. No, this article is not about the show as a whole. It’s about one very specific element of the show that was so well done I’m still thinking about it a month later: its use of 3D printing. In Lost in Space, the 3D printer aboard the Jupiter 2 is almost a character itself. Nearly every member of the main cast has some kind of interaction with it, and it’s directly involved in several major plot developments during the season’s rather brisk ten episode run. I’ve never seen a show or movie that not only featured 3D printing as such a major theme, but that also did it so well. It’s perhaps the most realistic portrayal of 3D printing to date, but it’s also a plausible depiction of what 3D printing could look like in the relatively near future. It’s not perfect by any means, but I’d be exceptionally interested to hear if anyone can point out anything better. You can search by computer or by title. There are also ratings about how visible, realistic, and important the computer is for each item. The database only contains fictional works, not commercials or documentaries. The oldest entry we could find was 1950’s Destination Moon which starred a GE Differential Analyzer. Well, also John Archer, we suppose. We assume GE had a good agent as the same computer showed up in Earth vs. the Flying Saucers (1956) and When Worlds Collide (1951). You can see a clip of the computer’s appearance in Earth vs. the Flying Saucers, below.